The Mad Mod Quilt Guild is a positive community of modern quilt makers interested in sharing their work and knowledge of quilting techniques, patterns, fabrics. You don’t think I’m just forcing you to make blocks I love, do you??!? Because this month we’re all going to make CHICKENS!! I saw this block posted on Quilty Love and I kinda lost my mind. I knew it would be so much fun in a mix of styles and fabrics. 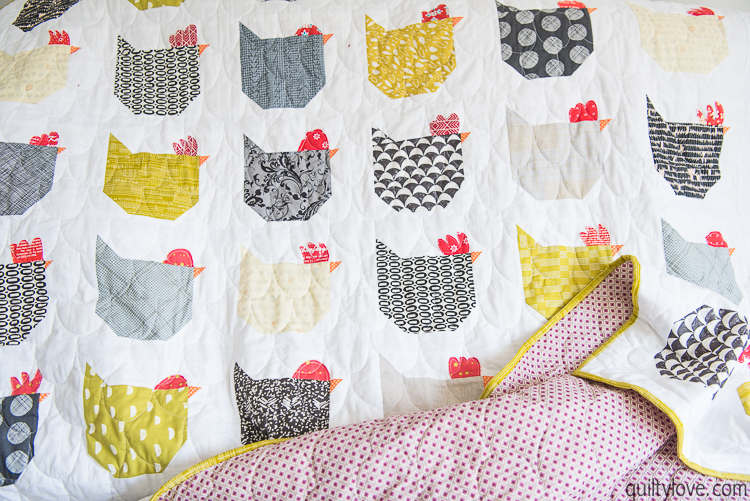 photo borrowed from Quilty Love – don’t you just love these chickens???!? Here’s the tutorial to use for the blocks. It’s not a square – it ends up 7″ x 8″ unfinished. ANYTHING GOES for the chicken body fabric – the CRAZIER the BETTER! These will be due at the November 8, 2018 meeting. For every block you bring, you’ll get one entry to win the whole lot … so the more blocks you bring, the better your chances.